Occupy Newfoundland and Labrador: The Rent Is Too Damn High (in St. John's). 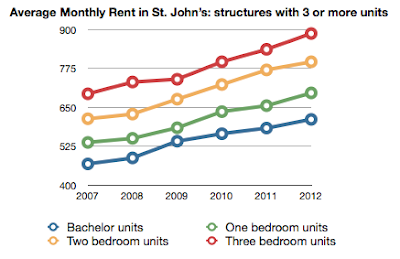 As everyone knows, housing prices in St. John's have been skyrocketing. Between 2008 and 2012, house prices rose 69% and rental prices rose 25% in nominal terms. So what do we make of this? 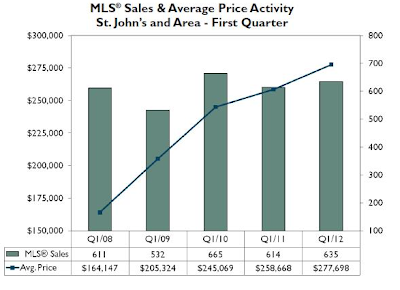 According to this CBC story, this price surge means "the St. John's market doing almost twice as well as the Canadian average" as though rising prices are clearly a good thing. 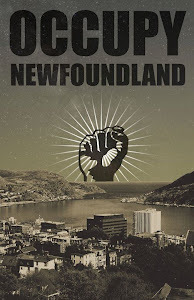 But while rising housing prices are a boon to the real estate industry and to home owners who are planning to sell their homes and move elsewhere, it is bad news for renters, bad news for people hoping to move to the city, and as I hope to persuade you, bad for the NL economy. The Rent Is Too Damn High is a e-book by Slate blogger Matt Yglesias. The title was taken from gubernatorial candidate and internet sensation Jimmy McMillan. Like many affordable housing advocates, McMillan framed rising rental prices as a poverty issue: people are going hungry because they can't afford to pay the rent. While I certainly agree that the effect of rising rent on the poor is a very important aspect of this issue, high housing prices also have other ill-effects and activists would do well to arm themselves with arguments that go beyond appeals to charity. Yglesias argues that rising housing costs in America's most prosperous urban centres (NYC, Washington D.C., Silicon Valley,...) have contributed to the tepid GDP growth and wage stagnation of the last few decades. His argument in a nutshell is that the US economy is increasingly a service economy, so workers can increase their productivity by moving to places where there are lots of people who need services. As a result, wages tend to be higher and unemployment rates lower in major population centres. Thus people have an incentive to move to big, dense cities and this drives up demand for housing in big cities. Unfortunately, obstacles like zoning restrictions and NIMBY lobbying mean that developers can't build new housing to meet the demand and this drives up prices. As a result, people have trouble moving to where the good jobs are and the economy stagnates. In this chart, blue is the North East Avalon plus Corner Brook, Grand Falls-Windsor and Bay Roberts. The unemployment rate is much lower in larger population centres. 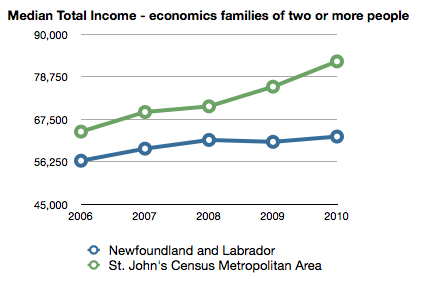 It is also the case that incomes are higher in St. John's than elsewhere and the gap is growing. These differences in labour market conditions are driving a population migration from rural to urban areas. The population of the St. John's CMA grew from 181K to 197K between 2006 and 2011, while the rest of the province shrank from 324K to 318K. Furthermore, it is the smallest communities that are shrinking the most; every town with a population over 4500 grew between 2006 and 2011, while most rural communities are shrinking rapidly. 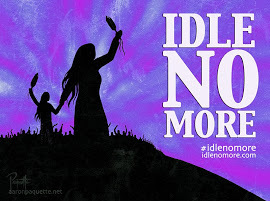 This migration is likely to accelerate due to new changes to employment insurance and trade agreements that will make it even harder to earn a living in rural Newfoundland. This could go on for some time, because only 60% of the NL population is urban compared to a Canadian average of 80% urban. In my opinion, one of the most important things we can do to build a stronger economy is to accommodate this migration by keeping housing affordable in the City of St. John's. This means allowing developers to meet demand by building more high density housing in the city, by relaxing zoning restrictions and standing up to NIMBY resistance. A lot of development has been stopped by residents worried about traffic, parking and aesthetics. These concerns are valid, but they need to be balanced against the effect on poverty, unemployment, economic growth and urban sprawl. City dwellers should also consider that population growth means more customers for local businesses and more tax payers to share the cost of municipal services. The tricky thing is that the benefits of development are widespread but subtle and the disadvantages are local and obvious. I don't know what the solution is, but I'd love to hear what you think about it. I focused in the original post on the labour market, but there is another side of this issue that deserves recognition. Because services can be provided more productively in population centres, those services will be better and cheaper than in rural areas. Medical and Health services tend to be better, and retailers offer cheaper prices and better selection due to competition and economies of scale. Rising housing prices in the city excludes people who would otherwise choose to take advantage of these better and cheaper services.